(272 x 373 mm) 13 x 19 in. SMALL 10 x 13.7 in. (254 x 348 mm) 12 x 16.9 in. (386 x 530 mm) 18 x 24 in. LARGE 21 x 28.6 in. (530 x 728 mm) 32 x 24 in. This powerful thangka of Mahottara Heruka (Tib. 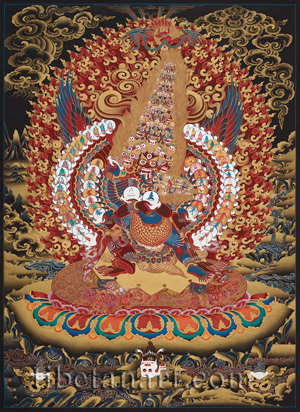 Chemchog Heruka), or Mahashriheruka, meaning the 'Great Glorious Heruka', was painted by Chewang Dorje in 2003. Mahottara is the lord or 'unified form' of the eight meditational deities of the Drupa Kagye (Skt. astamahasadhana) or 'Eight Great Sadhana Teachings'of the Nyingma Mahayoga transmissions. He is also the wrathful progenitor of all the hundred peaceful and wrathful deities of the zhitro or bardo mandala. The eight Drupa Kagye teachings were originally compiled by Vajradharma, the 'keeper of secrets', who concealed them in directional caskets beneath a stupa in the great Indian charnel ground known as Sitavana, or 'cool grove'. Along with these was concealed a ninth central casket studded with jewels, which integrated and unified the deity practices contained in the other eight caskets. Eventually the eight great Indian masters - Vimalamitra, Humkara, Manjushrimitra, Nagarjuna, Padmasambhava, Dhanasamskrita, Rambuguhya, Shantigarbha - assembled at Sitavana to receive their heruka deity terma or 'concealed treasure' teaching from each casket, which were respectively made of gold (Chemchog), silver (Yamdak), iron (Yamantaka), copper (Hayagriva), turquoise (Vajrakila), rhonoceros horn (Mamo Botong), agate (Jigten Choto), and gzi stone (Mopa Draknag). However, none of them were able to open the ninth jeweled casket at this time, the teachings of which were later revealed to Padmasambhava when the casket miraculously sprang open. Mahottara is also known as Mahashri Heruka, meaning 'Great Glorious Heruka', who is extremely wrathful and dark brown in colour, with twenty-one faces, forty-two arms, and eight legs. He stands leaning to the left in alidha posture, with his four in-drawn right feet and his four extended left feet pressing down on the disc of an eight-pointed golden chakra or discus. Crushed between this chakra and his red sun disc are eight worldly gods and eight animals. The four gods under his right feet lie upon their fronts with a white lion, a black dog, a red camel, and a grey elephant above them; and the four gods under his left feet lie upon their backs with a brown bull, a black horse, a red makara, and a green naga-serpent appearing above them. The patterned orb of his red sun disc rests within the upward-pointing petals of a pink lotus and the larger downward-pointing petals of a multicolored lotus, which in turn rests upon the golden surface of a vajra-rock formation. His powerful brown body is adorned with the 'ten attires of the charnel grounds': his forehead, cheeks and chin are smeared with cemetery ash, fresh blood, and human fat. A flayed elephant-skin is stretched behind his back, a flayed human-skin is draped around his neck, and a loosened tiger-skin loincloth is bound around his waist. His body and limbs are adorned with writhing serpents, his heads are adorned with five-skull crowns, and he wears two garlands of fifty severed heads around his neck. He possesses vajra-wings, and abides within a blazing mass of pristine-awareness fire. His body and limbs are also adorned with both the 'six bone ornaments' and the 'eight golden ornaments', and his long garlands of severed heads are entwined with the coiling serpents that form his sacred thread. Each of his twenty-one wrathful faces has a gaping mouth with bared fangs, a twisting tongue, upward-blazing facial hair, and three round and piercing red eyes. These twenty-one heads are arranged in seven triple-faced tiers, which diminish in size as they ascend in front of the upward-blazing mass of his tawny hair. The three faces on the first tier are dark brown (centre), white (right), and red (left). The central faces on the six tiers above are all black, and their ascending right and left faces are: brown and blue (second tier), white and red (third), blue and brown (fourth), white and red (fifth), brown and blue (sixth), white and red (seventh). An alternative colour sequence describes his main central face as being black, with the six central faces above it all being blue; his seven right faces all white, and his seven left faces all red. In each of his forty-two hands he holds a white blood-filled skull-cup, each of which contains one of the forty-two peaceful deities of the bardo or zhitro mandala within a white or golden orb. His first two hands are crossed in front of his heart as he embraces his consort, with blue Samantabhadra appearing in his right hand skull-cup, and white Samantabhadri in his left hand skull-cup. With his other twenty extended right hands he holds (from the top downward): The five male Buddhas of the Enlightened Families; the eight great male Bodhisattvas; the four wrathful male gatekeepers; and the three sages of the three higher realms (gods, asuras, and humans). With his other twenty extended left hands he holds (from the top downward): The five female Buddhas or Enlightened Consorts; the eight great female Bodhisattvas; the four wrathful female gatekeepers; and the three sages of the three lower realms (animal, preta, and hell realms). Mahashriheruka's female consort is Akashadhatvishvari, the 'Queen of the Realm of Space', who is also known as Khrodeshvari, the 'Wrathful Queen', and in Tibetan as Namshyalma (gnam zhal ma). She is extremely fierce and deep blue in colour, with nine faces, eighteen arms, and four legs. With her two right legs extended and her two left legs wrapped around her lord's waist she presses every part of her body against his, her heads tilted backward in the passion of their 'face to face' sexual union. Her naked body is adorned with the 'five bone ornaments', serpents adorn her golden bracelets and anklets, and each of her heads is adorned with a five-skull crown. She wears a leopard-skin loincloth, a garland of fifty dry white skulls, and a garland of fifty freshly severed heads. Each of her nine wrathful faces has three round eyes, a gaping mouth, a twisting tongue, and upward-blazing hair. Her faces are arranged in three ascending tiers of three dark blue, red, and light blue faces, although her three right or rear faces cannot actually be seen in this painting. With her first and uppermost right arm she embraces the neck of her lord as she holds a vajra behind his main heads, while she offers a skull-cup full of blood to his lower right face with her first left hand. With her other eight extended right hands she holds white skull-cups that contain the wrathful forms of the eight matrikas (Tib. mamo) or 'mother goddesses', which represent the 'eight sensory bases of consciousness'. Each of these mother goddesses wears a leopard-skin loincloth and dances wildly amidst a blazing mass of fire, and here they are identified as the wrathful manifestations of the eight great male bodhisattvas. With her other eight extended left hands she holds skull-cups that support the wrathful forms of the eight pishaci, which represent the corresponding 'eight sensory objects'. Each of these pishaci goddesses wears a leopard-skin loincloth and a scarf made from a flayed human-skin: and they are sometimes identified as the wrathful manifestations of the eight female bodhisattvas. The serpent-devouring form of a red garuda crowns Mahottara's stacked pinnacle of twenty-one heads. The black background of this painting depicts a landscape of shaded golden clouds, flames, mountains and rock formations, where many rivulets of water flow. In the lower foreground are three skull-cups, the outer two containing offerings of swirling nectar and blood, while the upturned central skull contains the wrathful offering of the five torn-out sense organs; eyes (sight), ears (sound), nose (smell), tongue (taste), and heart (touch).